R.I.P. Bruce L. Johnson, Chinese Wand Grandmaster, 1926-2014. Born on 21 June 1926 and died on December 11 2014 at the age of 88. Bruce L. Johnson arrived safely home in heaven December 11, 2014, departing from Stillwater, MN. Survived by loving wife Shari of 48 years; devoted nieces Debbie Jankura and family, and Pamela Robb; brothers-in-law John and Tom Quam and families, sister-in-law Marty Quam and family, beloved dogs Samantha and Gracie. Preceded in death by parents Roy and Eda Johnson, sister Babette Robb, and his once in a lifetime dog Spencer. Was active in naval operations during WWII where he served as a Navy Ranger. 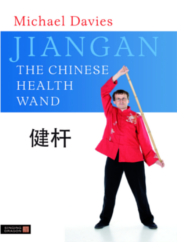 After the war he became a proponent of health and fitness and eventually introduced to the U.S., the Chinese Wand Exercises, which he learned in China and authored a book of the same name. Later in life he became a born-again Christian, attended a Christian college in Ft. Myers, FL where he eventually became a professor and taught cult awareness and world religions. His life touched people in many ways, some of which will only be revealed to him now, in heaven. A family graveside gathering will take place at a later time. Thank you Bruce for introducing the Chinese Wand Exercises to the West. I emailed a `thank you’ reply and told them I had a book coming out which acknowledges his work but I did not receive another communication from them. Even if Bruce did not want to get involved with the Wand Exercises again I am glad that he considered that his role in history had been fully acknowledged. 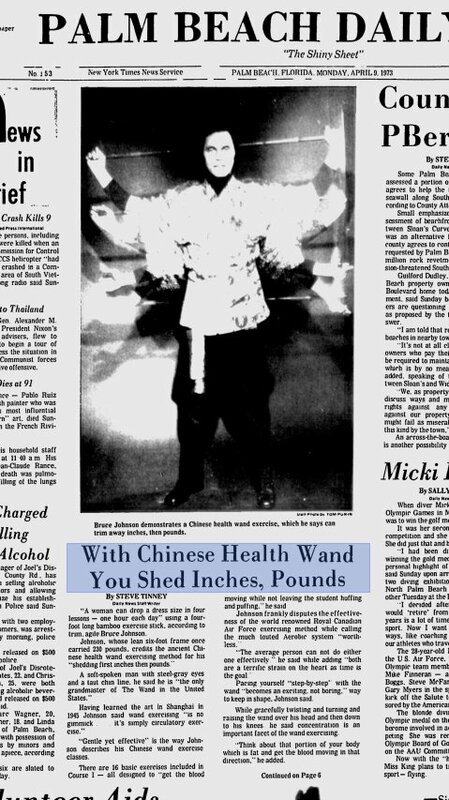 Bruce L Johnson is the man who brought Chinese Wand Exercises to the West at the end of the Second World War. While serving with the US Navy in Shanghai in 1945, he took a rickshaw ride that led to him to a ninety-three year old Chinese Wand master who taught him the secrets of the Wand system. 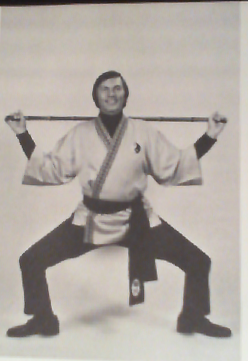 This was many decades before Kung Fu, Tai Chi Chuan or Qigong were known outside China. 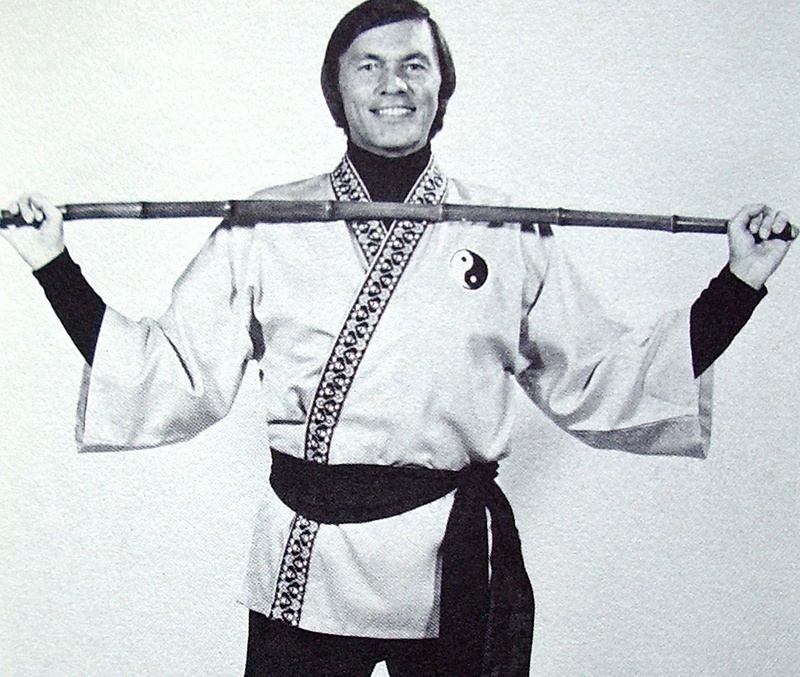 Johnson began teaching the art in the 1960s and published his book `Chinese Wand Exercises’ in 1977. As fitness instructor at Paramount Studios Johnson taught the Chinese Wand Exercises to many famous actors, including Clint Walker (the large muscular guy in The Dirty Dozen), James Coburn, Mae West, Ryan O’Neal, Lorne Greene, Liberace and others. 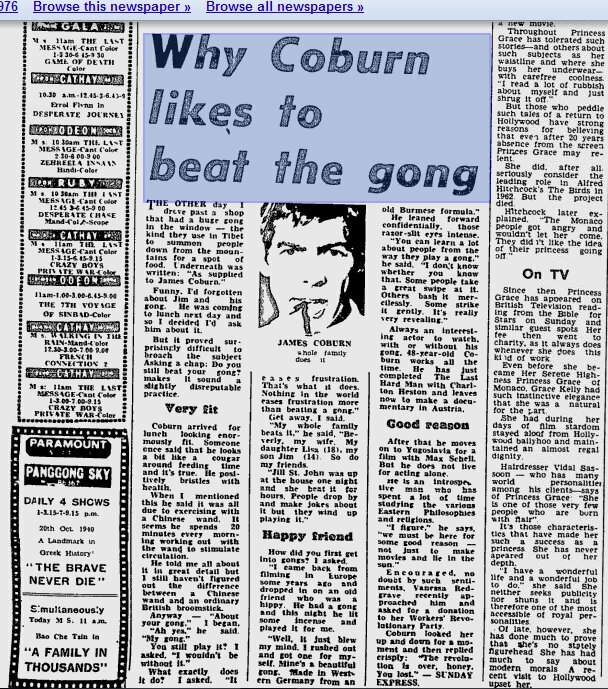 The exercises improved Walker’s bad back while Coburn used the exercises as a calming technique.